We create powerful websites from scratch ensuring your Company’s brand and identity is showcased whilst delivering a purposeful experience, giving visitors a reason to get in touch. We create clean, professional and easy to use Websites for your business in London. Your Website is a statement of who you are and what your business is all about. It is often the first impression people can get on your business. So, choosing the right Web Design for your business always matters! 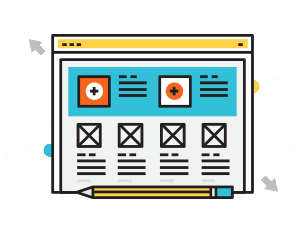 No matter how simple or complex your requirements are, Design Direct has the expertise in building bespoke Websites for: Online Shops, Membership Sites, Property Portals, Recruitment Websites, Customer Management Applications and many more. We bring awesome Business Website Features to bring transformation to your business. Ensures your visitors easily access your website on their device wherever they are. Your website is optimised for high performance so that it improves conversion rates. Our designs impacts the number of organic visitors your Website gets. We enable Google Analytics in your website to measure its performance. We set up landing pages and create sales funnels to generate you new business. We enable CMS so you can regularly publish fresh and engaging content. We include Social Media buttons so that your Website is sharable. Robust Security is enabled through strong firewalls, SSL certificates and more.